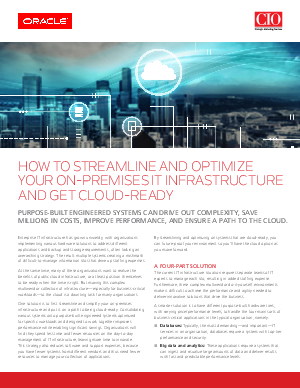 > This program is brought to you by Oracle and Intel > Is Getting Your Infrastructure Cloud-Ready a Daunting Task? Leave unwieldy infrastructure behind and get cloud-ready with Oracle Exadata. If you’re finding that on-premises IT infrastructure complexity is holding you back, it’s time to streamline and simplify. Find out more about our family of purpose-built Oracle systems that can help you consolidate infrastructure and get the performance your business needs. You’ll be ready to make the most of cloud benefits, when the time’s right for you.